A new battery system, softlites and a studio flash will all be available from Elinchrom. Elinchrom are to launch a series of new products and you can get your hands on the new equipment at Photokina. A new flash unit, portable battery flash and Rotalux softboxes are all on the list to be launched over the next year. The new Elinchrom BX 250Ri and 500Ri studio flash units will be available soon and Chris Burfoot believes it will be the worlds most advanced studio flash unit, he said: "I have been playing with one for a couple of weeks and it's truly awesome, especially with the built in Skyport." 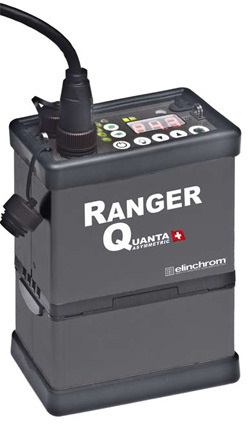 The portable battery flash, which is called Ranger Quanta will be available towards the end of February 2009 and it features intelligent battery, slave cell and flash power options as well as radio remote control power and flash trigger settings. A range of updated diffusers and light boxes will also be released. EL-SKYPORT Radio remote control of POWER SETINGS and FLASH TRIGGER. 4 GROUPS / 8 FREQUENCIES for group workplaces / multi studio operations. EYE-CELL, AUTO PRE-FLASH DETECTION plus programmable modes. VFC, Visual flash confirmation option. PLS, Proportionality adjustment of the modelling lamp range. SPEED FLASH for sharper images. HIGH IMPACT resistant body shell. RUBBERISED HANDGRIP with built in fuse storage. MULTIVOLTAGE auto-detection, 90-270 V (excluding modelling lamp). INTELLIGENT BATTERY POWER OPTIMISATION Auto Power-Off, programmable Pilot Light duration, super efficient LED Pilot Light. INTELLIGENT SLAVE CELL, red eye pre-flash auto-detect, programmable and pre-set effect modes. INTELLIGENT FLASH POWER OPTIONS Two outlets - Asymmetric 2 : 1 ratio, single high power channel, single superfast flash channel. RANGER Q HEAD Compact, lightweight, interchangeable cables. Fold down, pack away. No dismantling. Grey rip piping professional finish. New speed-ring lightweight and stronger, only 263 g.
Fore more information visit Elinchrom's website.